It's the holiday bonus that's also good for the boss. 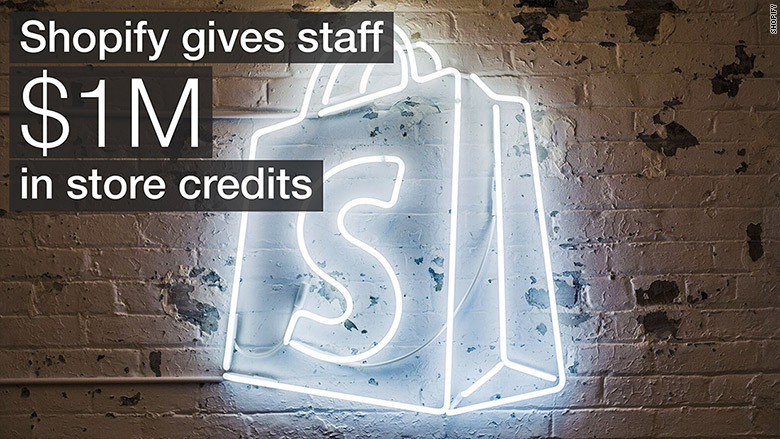 Shopify is giving away $1 million to its employees -- in Shopify credits. The company sells e-commerce technology used by 200,000 merchants. Those include startups like GoldieBlox, which sells engineering toys for girls; Leesa, a mattress retailer; Tesla Motors (TSLA); and roughly 1,000 nonprofits like Charity Water. Now, each of its 1,000 employees will get $1,000 to spend wherever they choose. "We had a really incredible year," said Shopify (SHOP) marketing chief Craig Miller. "We wanted to give a big thank you to our employees, but also thank our merchants." The company went public in May and has exceeded revenue and profit expectations. The company also struck up integration partnerships with big tech firms including Facebook (FB), Twitter (TWTR) and Amazon (AMZN). The majority of Shopify's merchants are based in the U.S., but its employees are based in Canada. So the holiday gift to employees is a reminder to retailers. "Make sure you're shipping to Canada," said Miller. Employees are starting to compile lists of what to spend their money on. "I've already heard of people wanting to donate to charity. Some want to buy mattresses, bicycles," said Miller. Shopify, founded in 2004, has a history of finding creative way to treat employees for the holidays. "We wouldn't give you the $1,000 until you booked the trip," said Miller. As employees explored the world, postcards started to roll in from places like Bangkok, Hawaii, China and India. In 2013, the company hosted a weekend getaway for employees and their spouses at a ski village in Quebec. It was a nod to the company's roots as a startup that powered an online snowboard store. "Each year, we try to outdo ourselves ... which is actually the big challenge," added Miller.